Did you have to have a cesarean? If you did, was you team respectful of your wishes? Did they try everything to help you and your baby from needing to go under the knife? 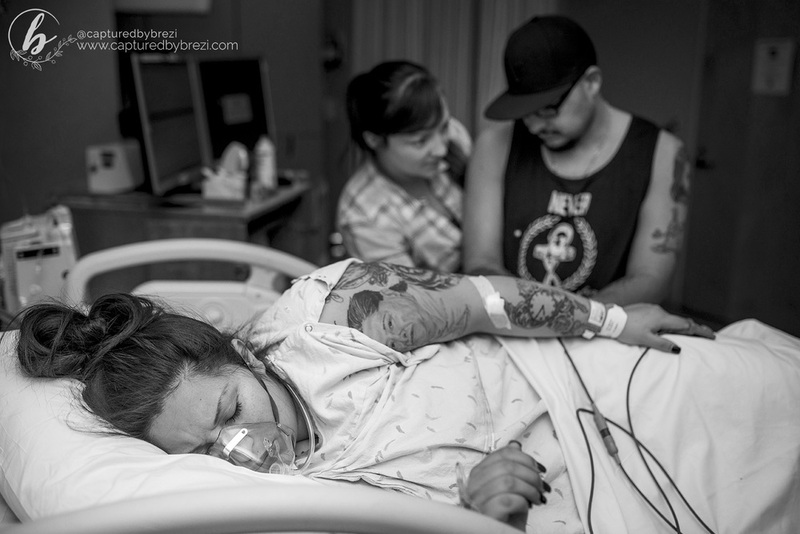 Was your photographer or doula allowed in the OR with you, or were they forced to stand aside to helplessly watch, not being able to do their job? To support you by way of emotional support or documenting your baby's arrival. I photographed a lovely birth the other night. It wasn't lovely in the way that you would think. It didn't go just the way she wanted, in fact it probably broke every rule she had in place. Trying for a VBAC at home, yet needing to transfer to the hospital. Trying for a vaginal birth, yet needing another cesarean. It wasn't lovely because of those things, but rather she had a team willing to do everything in thier power to let her try to do it the way she intended. She had a team willing to go the extra mile. And when it came to the decision to have the cesarean, she had a team willing to let me, the photographer, back so that she can have these memories. Not just pictures, but tools to help her realize her strength, her beauty, and help her cope with the way her birth needed to happen. Memories that they will cherish for a lifetime. Something her son will look at and think, wow my mom is amazing! Birth photography is quickly becoming less of a luxury and more of a necessity, because when it's all over with, memories fade but a picture will last a lifetime. It is my pleasure to share with you today some extraordinary images of a beautiful family and wonderful birth. Deidre also is sharing with me her birth story that I have put below. Be sure to read it, and leave her and her family some kind words as they recover and enjoy living life with two. .
"Early morning labor started 5:30 am Thursday February 25th. I was awakened with bloody show and contractions and they kept steady but we're still about 8 mins apart. I wasn't sure as to what was going on so kept going about my day. I kept getting up and stretching, trying to work him down. I had been in touch with my midwife to let her know. Then my water broke 12:35 am Friday 26th. At the time I wasn't completely sure if that's what it was because I've never experienced that before. It felt like I peed right after I went to pee as soon as I stood up a little gush came but didn't smell like urine. So I ignored it for a few hours then I decided to take a bath because contractions had gotten a little more intense. When I stood up from the bath more fluid gushed, but this time it had a green (noticeable) tinge to it. At that point I was a little concerned but left it alone. Then about 6:30am I decided maybe this is my water because contractions had gotten to 4-5 mins apart about and were pretty intense. So I let my midwife know and she came on over and checked. Sure enough it was my water, and I was at 6 cm dilated 90% effaced! We worked on some tricks to help get things really going. I mean constantly we were trying EVERYTHING they'd get really good then contractions would space out. Finally at nearly 36 hrs, at about 12 noon we decided it was best that we went to the hospital due to meconium in the fluid and my water being broke so long without progression. We packed our bags and went on over to the hospital as reluctant as I was but I was already tired too so my wonderful midwife Tiffany accompanied us. We got settled in and they started us on pitocin. I called my birth photographer Brezi in because we thought once we got that little push we'd get going fast because initially we had progressed fast then slowed down. Everything started getting really intense to 2 mins apart but again I wasn't progressing on dilation. The contractions were so tense and I couldn't relax, finally after nearly 65 hours I got an epidural to help me relax a little more because that was no joke! It was intense. the Dr. discussed another C-section with us but ultimately gave me the choice. We did have to think of all outcomes and possibilities. At this point we were exhausted and I asked for one more hour to try more and everything we could so best believe Dr. Williams helped me do just that to avoid another C-section. Literally half numb I was changing positions and I was finally complete and we got the best news it was time to push being overly ecstatic because I FINALLY got the chance to have my VBAC that I've always wanted! His heart dropped big time and they started telling me they have to resuscitate him he was not responding well to meds. At that point I broke down. Nothing like I wanted, but my son's health safety and well being depends on me. We were rolling down the hallway into the operating room to have a repeat C-section. I couldn't have been more grateful for the team I was handed, they really made this experience for me a much different. Opposite of what I have experienced before with my daughter's birth, they gave us the most family centered cesarean anyone could ask for. They allowed our birth photographer in with us to capture the moment of our son being born, and that meant the world to me. Even if it meant through an incision in my abdomen, they brought him right to me after birth. They let daddy cut the cord, and they let him stay with me until we were done as he came out perfect. I honestly couldn't have done all of that without my birth team. First off my husband who was truly my rock through everything, my midwife Tiffany, who encouraged and supported me through this entire pregnancy and delivery. She never once made me feel like just another patient she truly was present. Brezi, our birth photographer, it takes a special eye to capture those intimate, powerful, loving, life changing moments and create beautiful images that speak volumes to you. She did that and more. Came to see us and be great support during and very long and crazy labor process. Being professional and even a friend I never knew I could have. Lastly, Dr. Williams and her team who truly helped put the last puzzle pieces together to make my birth something special and as much family centered as possible by making seemingly impossible things happen. She tried everything to help give me what I wanted but ultimately gave me what I needed. I can't thank them all enough, there are no words I can express to them. While I had big plans for something completely different someone else had different plans for us and my baby is here healthy happy and thriving. "